In the electrical field, as well as other areas of construction, prep work is essential. Without it, every job would be a disaster. It’s the little things that are done in the beginning stages of a job that make all the difference. If your foundation is not level, the building won’t be either. One thing that requires precise prep work is post lighting, from the conduit to the bolts, everything must be put in the right place. Once the concrete is poured, there’s no turning back. 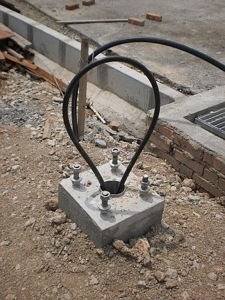 Most post lights come with a bracket that positions the bolts in the proper place, and a lot of adjusting, positioning, and leveling is required. If done correctly, the post light will fall right into place when it comes time for the installation. With that in mind, let us consider the story of Jesus riding the donkey into Jerusalem. Jesus told the disciples where to find the donkey that he was to ride upon, and, if anyone were to question them taking the donkey, they were to tell them that Jesus commanded it, and they would let them go. This story begs the question: why would the owner of the donkey just let them go? Was there some divine altering of the will of the owner, or did he choose this himself? Who was this person that owned the donkey? The bible seems silent on this fact. There must be more to this than the text suggests. Perhaps The Lord had prepared this person to give the donkey to Jesus. This seems to fit with the character of God. He is always molding and shaping us to prepare us for His service. Just as the bolts were prepared for the pole light, God prepares us to fit the plans He has for us. Donkeys were symbols of wealth in this era. And they were loyal creatures that loved their masters. So, this was no small sacrifice for the owner to give his donkey away. Maybe the Lord spoke to him in the still of the night. Maybe tragedy softened his heart to the riches of this world. Somehow, The Lord prepared him. The Lord may be preparing you as well. Has your life been shifting and changing? Has it been unstable? God may be fitting you for His purposes. The day will come when everything will fit together perfectly. The bolt may be a small insignificant thing, but, without it, the light could not stand. Some of the greatest people in the Bible were insignificant, but they were used mightily of God. Think of the boy who’s lunch fed thousands, a fisherman, a tax collector, and a nameless owner of a donkey that would carry the Messiah into Jerusalem. You may feel insignificant, but God may be doing the prep work for His great purpose for your life. This entry was posted in Uncategorized and tagged Christian, electrician, preparation by tdmannn. Bookmark the permalink.